. 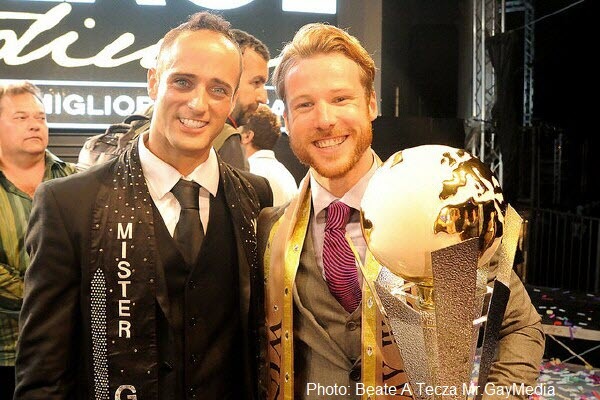 The title of Mr Gay World 2014 goes to Stuart Hatton Jr (photo right) from the United Kingdom who was a strong candidate throughout the whole competition. 32 brave, proud and good-looking men meet in Rome the last week in August, the competition is tough and only one can win the title. Delegates from 32 countries around the world where in the eternal city of Rome for the sixth annual Mr Gay World competition . In co-operation with the famous party venue Gay Village Rome, the delegates had to contend in different competitions for a whole week until one of them had the titled Mr Gay World 2014. Mr Gay World is more than a beauty contest, it is the toughest job interview in the world! Mr Gay World celebrates the pride and rights of the International Gay Male. Mr Gay World’s visionary pillars are friendship, diversity and respect! The man selected will be a role model and ambassador for young gay men of the world. Some of the challenges the delegates had a written test, photo session, sports challenge, swim wear competition, online popular vote, art challenge, speech and a strenuous 'job interview' in front of seven judges from all over the world.